Do you ever have a hard time figuring out what to eat for lunch or dinner on an ordinary weekday? We certainly do in our house. With a family of four with different tastes and preferences, we often end up making dishes where everyone can add or remove ingredients to adjust the dish to their liking. I’ve been thinking for a while about adding a new category here on the blog. A category with recipes and tips for family food. Dishes that are simple and quick to make, and that works for our little family. Perhaps some of them will work for your family too? So, starting today there will be a new category named “simple family food” where those recipes will appear. This Curry is one of the dishes that we end up making often. 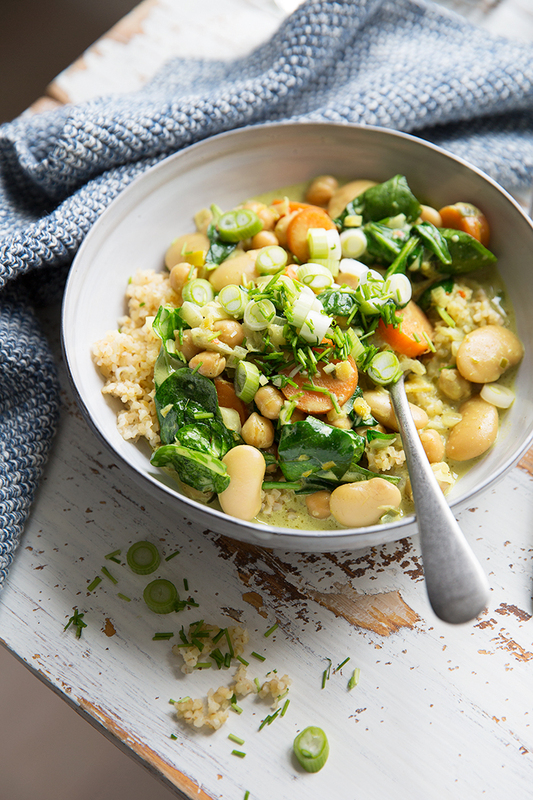 And for this blog post, I made a vegetarian version using white beans and chickpeas. But the recipe is super easy to adjust to your tastes and what you feel like at the moment. For example, stir fried chicken or fish is a perfect addition if you have it. This dish is also perfect for using up vegetables in the fridge. The most important ingredients for maximum flavor are the six first + curry and coconut milk obviously. But feel free to use any root fruits (potatoes are great! ), pepper, mushrooms, cauliflower or broccoli florets etc. if you have them. And I’m really curious to know – do you have kids? Are they picky with food? And if so, how do you solve it? Find some of my tips below the recipe. 1) In a large pot heat the coconut oil over medium heat and add onion, leek, garlic, chili and ginger. Sauté for 10-15 minutes until softened. 2) Add the curry powder (or paste) and stir until everything is coated in the spices. Add coconut milk and bring to a boil. Add carrots and fennel and cook for 10-15 minutes until the vegetables are soft. 3) Add the beans/chickpeas and cook for a few minutes. Season with salt, black pepper and lime juice. Add the fresh spinach leaves just before serving and let them cook just long enough to soften, about 1 minute. 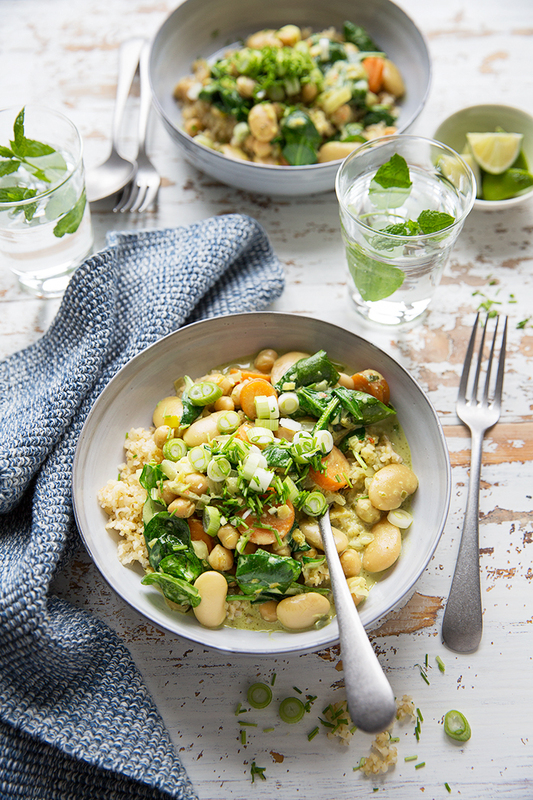 4) Serve with bulgur, rice or quinoa + chopped scallions and chives. TIPS FOR PICKY KIDS! If you have picky kids, try to make the sauce as “basic” as possible and serve the beans, chicken or whatever protein you use in bowls on the side for everyone to choose for themselves. You can also serve stir fried mushrooms, peppers, cooked broccoli etc. on the side so that everyone can choose what they like – or avoid ingredients that they don’t like. My 9-year old son for example literally hates mushrooms, but when served on the side he doesn’t have to worry about them. And if your kids have a hard time eating onion, try grating it so finely that they can’t see it. Made this last night and it was delicious! I used one cam of coconut milk and one can of Trader Joe’s green curry simmer sauce. I added some frozen green peas I had laying around and served on top of rice. I love the green freshness and veggies I don’t normally associate with green curry!